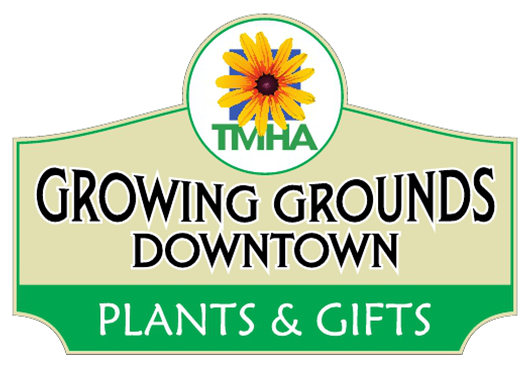 Spread some holiday cheer by supporting our Growing Grounds Downtown store. Visit our downtown store for your holiday shopping needs! Growing Grounds Downtown is trimmed with fun holiday gifts from our local and fair trade vendors like beeswax candles, macrame plant hangers, house plants and holiday decor. Think of us for a selection of holiday plants, including succulent planters, unusual poinsettia varieties, air plant wreaths and special arrangements. Gift certificates are available in the store and by phone. And remember — one hour free parking at the garages on Palm Street! A program of Transitions-Mental Health Association. Our poinsettias are a community favorite! "The fundraiser is flawless and the poinsettia are high quality so it's easy to spend my decorating money to help TMHA." "Our office loved that we were able to help a great cause and receive beautiful poinsettias." "The poinsettias were beautiful and made my friends who received them so happy!" "You brought to my office and then took back to Santa Barbara street at my request. You were very accommodating." "Very good quality and excellent customer service." "I love TMHA poinsettias. The plants themselves are a great quality and I feel good to support a wonderful organization."